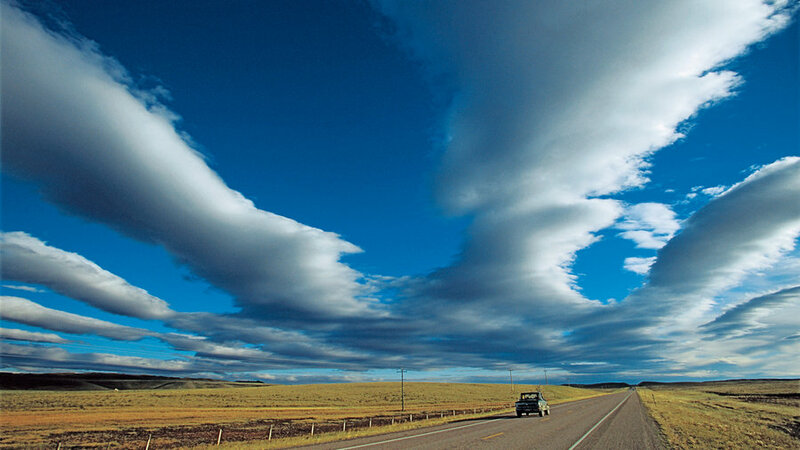 Heavenly highway: Between Browning and Glacier National Park, U.S. 2 shows off Montana's golden hills and wide horizons. Horses, dinosaurs, tepees. I steel my kids, Phoebe and Tobin, for the 500-mile round-trip with these three words. My mission is to take them on a summer vacation they’ll never forget: a tour of the Rocky Mountain Front that slices 100 miles north from State 200 to Glacier National Park in Montana. Wild, beautiful, and endangered, the Front is where the jagged, 8,000-foot limestone peaks of Montana’s Rockies descend to the prairie. It is home to the Blackfeet Tribe, cattle ranchers, and abundant wildlife, including grizzly bears and bighorn sheep. It has small-town rodeos, relaxed guest ranches, and roadside diners with good pie. The Front has fueled the imaginations of Montana writers as well as controversies between environmentalists and oil companies over whether to drill for the area’s oil and gas reserves. And with those horses, those dinosaurs, those tepees―and more―it makes for one of the finest family road trips in the West. From Missoula, we head east on State 200 over the mountains into a land of sky and cattle―the geography that was formed more than 100 million years ago when thick slabs of limestone were shoved east over the soft shales of an ancient inland sea. As we turn north on U.S. 287, my kids in the backseat, we belt out Aretha Franklin’s “Freeway of Love.” At the Milford Hutterite colony―one of 40 communal farming-based religious communities in Montana―we buy carrots from girls in long dresses and boys in black pants and suspenders who curiously eye my children in their shorts and T-shirts. On the plains, we spot towns, like Augusta, by clumps of cottonwoods. In the heart of cattle country, Augusta hosts one of Montana’s oldest small-town rodeos (Jun 26; 406/562-3477). Here, on July 8, 1806, Meriwether Lewis rejoiced “at finding ourselves in the plains of the Missouri which abound with game.” We happily eat pie at Mel’s Diner, then saunter across Main Street to check out the elk-skin purses at Latigo & Lace. The real action, however, is in the mountains that rise to the west, ragged as the back of a stegosaur. We drive along Gibson Reservoir Road―a route bordered by brown-eyed Susans and the Sun River―past huge, upended slabs that look as if giants had a rock fight. At Tobin’s fifth “when are we going to be there?” we reach the JJJ Wilderness Ranch, tucked in a swale of aspens. What I will remember of the guest ranch is the ample log lodge, the peach cobbler, and the 60 quarter horses thundering from corral to pasture. My kids will remember their steeds, Taylor and Bob. On our trail ride, we pause at a high meadow to see the dazzling “steel-blue army of mountains,” as writer Ivan Doig describes the Front, which “blade up … as if charging into the air to strike first at storm and lightning.” Tobin turns in his saddle and tells me this is the second-best day of his life. Now we enter dinosaur country: Choteau. After buffalo burgers at the Log Cabin Café, we listen to the “Diggin’ Up Bones” selection on the Antler Bar jukebox. Built near the more than 10,000-year-old Old North Trail, Choteau has an orderly Western feel, with a 1906 sandstone courthouse and wide, cottonwood-shaded streets. In Browning, headquarters of the 1.5 million-acre Blackfeet Indian Reservation, we pass a cement-tepee espresso stand and streetlights featuring cast-iron tepee silhouettes on our way to the Museum of the Plains Indian. Here we learn that the Blackfeet controlled the plains after acquiring horses in 1733, and we see beaded buckskin clothing, carved tools, and eagle-feather headdresses. Tobin is transfixed by the piskun diorama, a museum display that depicts buffalo plunging from a cliff, their bodies frozen midfall. At the Lodgepole Gallery and Tipi Village, flanked by two brightly painted Blackfeet tepees and Spanish mustang horses, we lie in our tepee, smelling prairie sage on the ever-present breeze. Later, after a traditional dinner of smoked trout and buffalo roast, we sit cross-legged in Darrell Norman’s ceremonial tepee as he tells my wide-eyed children stories of Napi, the Blackfeet trickster. We tuck in, content. That night, however, a wild prairie storm rolls in. It is a wet, miserable night―the stuff of family legend―but I see in my children the seeds of their adult selves: No one whines, we just cuddle together and wait out the storm. Next tepee stay, I note, check the weather. We celebrate the farthest point of our journey at the Glacier Park Lodge. In the restaurant near Two Medicine Creek, we choose from Kootenai, Piegan, or Blackfeet Indian tacos. Afterward, I line up my children and snap pictures of them next to one of the lobby’s 60 Douglas firs. Then we drive back over the mountains, dreaming of maiasaura dinosaurs, Indian ponies, and, of course, Taylor and Bob. The road from Missoula to East Glacier Park follows State 200 east, then heads north on U.S. 287 and U.S. 89. For information contact the Russell Country tourism office ( or 800/527-5348) or the Choteau Chamber of Commerce (800/823-3866). JJJ Wilderness Ranch. Dude-ranch vacations and horse-pack trips. 6 cabins; $1,345 for six nights, including meals and activities. On Gibson Reservoir Rd., 25 miles west of Augusta; or 406/562-3653. Mel’s Diner. $; breakfast, lunch, and dinner daily. 1 Main St., Augusta; 406/562-3408. Latigo & Lace. Regional art, books, and handcrafted gifts. 124 Main, Augusta; 406/562-3665. Viewforth. Two-room Craftsman bungalow with Victorian gardens. $85 per night. 4600 U.S. 287, 7 miles north of Augusta; or 406/467-3884. Log Cabin Café. $$; breakfast, lunch, and dinner Tue-Sun, reservations recommended. 102 S. Main Ave., Choteau; 406/466-2888. Antler Bar. 105 N. Main, Choteau; 406/466-2719. The Old Trail Museum. $3. 823 N. Main, Choteau; 406/466-5332. Seven Lazy P, Deep Canyon Guest Ranch. Horseback riding and pack trips. 9 cabins; $185 per night (four-night minimum) or $1,170 per week, including meals and activities. 3450 Teton Canyon Rd., 25 miles west of Choteau; or 406/466-2044. The Nature Conservancy’s Pine Butte Guest Ranch. Natural-history workshops. 10 cabins; $1,400 per week, including meals and activities. On Teton Canyon Rd., 27 miles west of Choteau; 406/466-2158. Two Medicine Dinosaur Center. Dinosaur history and models. $3, hands-on dinosaur programs from $35. On U.S. 89 in Bynum; or 800/238-6873. Museum of the Plains Indian. Clothing and arts of the Northern Plains tribes. $4. U.S. 89 at U.S. 2 in Browning; 406/338-2230. Lodgepole Gallery and Tipi Village. 10 tepees from $45. U.S. 89 at Durham Rd., 2 miles north of Browning; or 406/338-2787. Glacier Park Lodge. Stately 1913 log lodge. 161 rooms from $129. 1 Midvale Lane (off U.S. 2), East Glacier Park; or 406/892-2525.